Wanna help support the site? Well known bike light maker Knog was demonstrating their newest bike light at Outdoor Retailer this week – the Qudos. This new light is relevant around these parts as it combines onto a single mount both a bike light and an action cam mount. Let’s dive right into things. 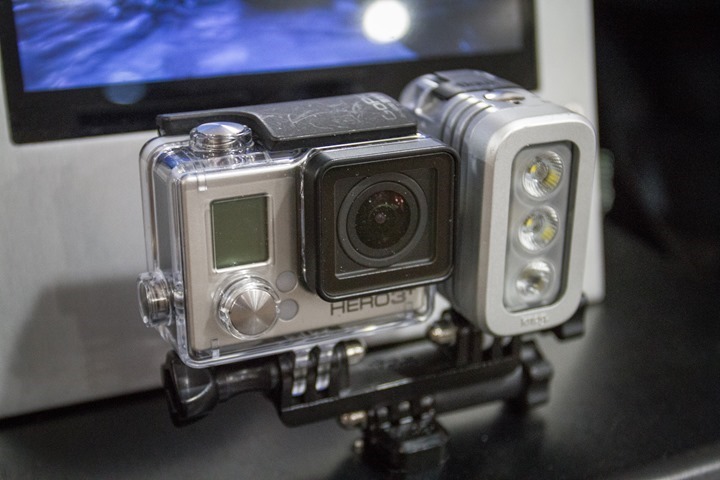 First off you’ll notice that both sides of the mount utilize the GoPro mounting system. This is nice because it minimizes losing specialty parts for the bike-mount side of the equation. It also allows for swappage of positions as I’ll discuss later when using cameras other than a GoPro. The mirrored mounts are most easily seen when you look at the bottom baseplate for the system. 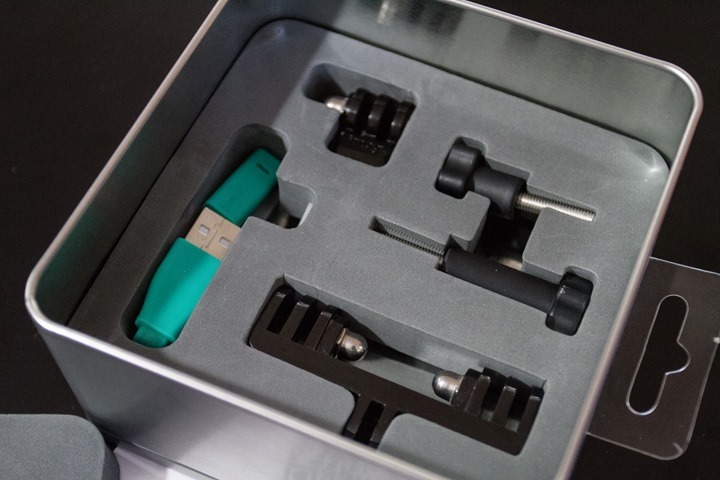 Included in the package are two screws – one longer and one shorter depending on which component you’re tightening up. 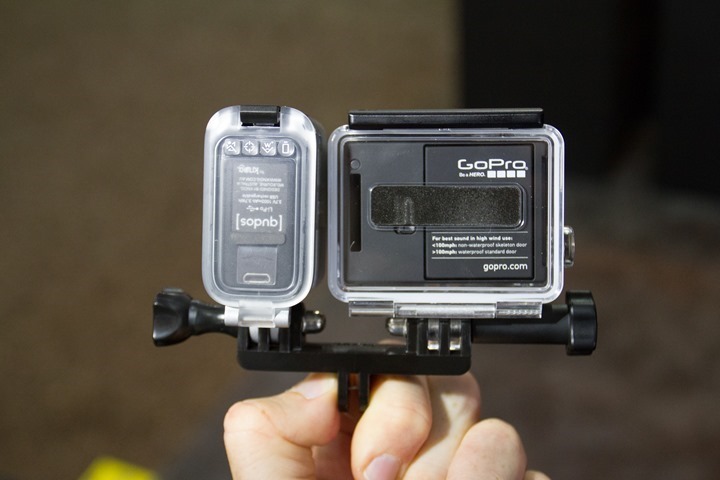 Both simply use the same GoPro screw system – so if you lose one it’s no big deal. Additionally in the package you’ll find a USB charging cable for the light, in-line with all of Knog’s lights being chargeable via USB. 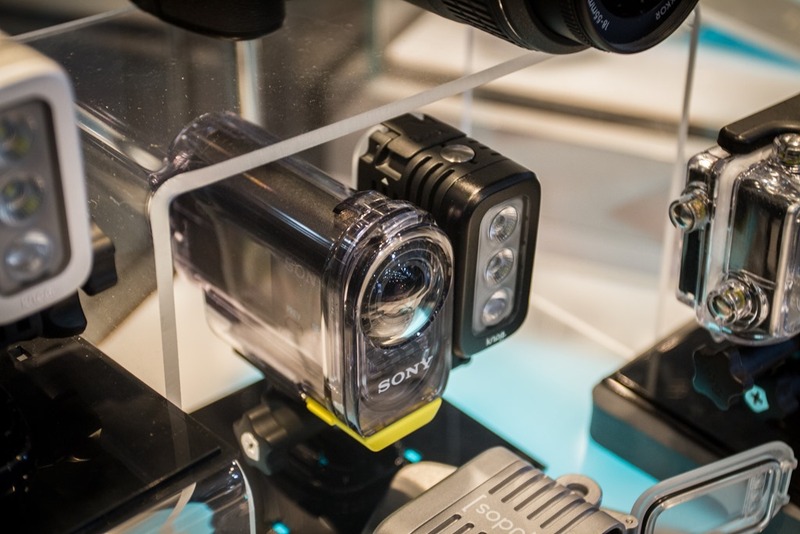 You’ll notice that the bottom of the Knog mount system in turn attaches just like any other GoPro camera would, so it in turn could be attached to any GoPro compatible mount system and in pretty much any possible location. Meaning you could use a stock GoPro handlebar/helmet mount, or something from another company. Within the box you’ll find (upper left above) a dual-purpose tripod and camera hot shoe mount for the light portion. 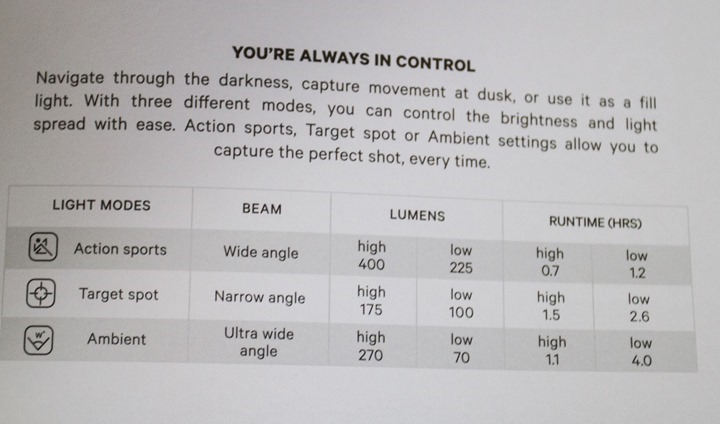 This means you could mount it on either a DSLR camera (or similar with a hot shoe), or onto a simple tripod. This little adapter just attaches to the GoPro compatible mount on the bottom of the light. The light draws from the 1000mAh swappable LiPo battery, for which they’ll also sell spares for in case you’re on a longer evening rendezvous than a single battery permits. The kit comes in two different color schemes: black or silver. The whole kit without the camera weighs 150g. Now interestingly, the entire system is waterproofed to 40m (that’s 131ft, or 1,692 inches…). 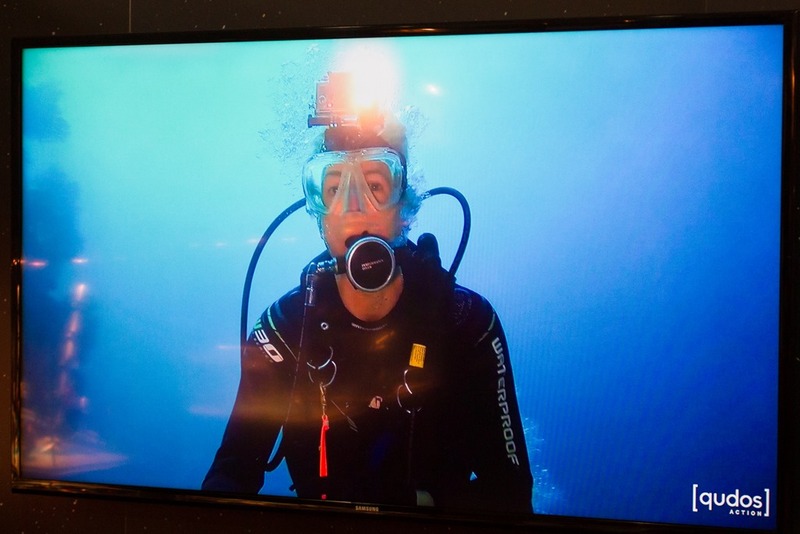 The idea behind it is that scuba divers could use it for recording as well. Alternatively, if you just make a really wrong turn while mountain biking and end up in in a rather deep lake, you’d still be good. Or rather, the light and camera will still be good. Last but not least, the unit is also compatible with an adapter for both the Sony action cams as well as the Contour action cams, both of which use the tripod-style adapters with the secondary support post to ensure they don’t twist/turn out of position. They didn’t have a Garmin VIRB in the booth to test, though I suspect it won’t fit because I believe it might be a hair bit too wide – especially with the red recording switch being on the same side as the light. Though you could actually switch the positions on the mount without any issue. It’s something I’ll test out here in a few weeks when a unit arrives. 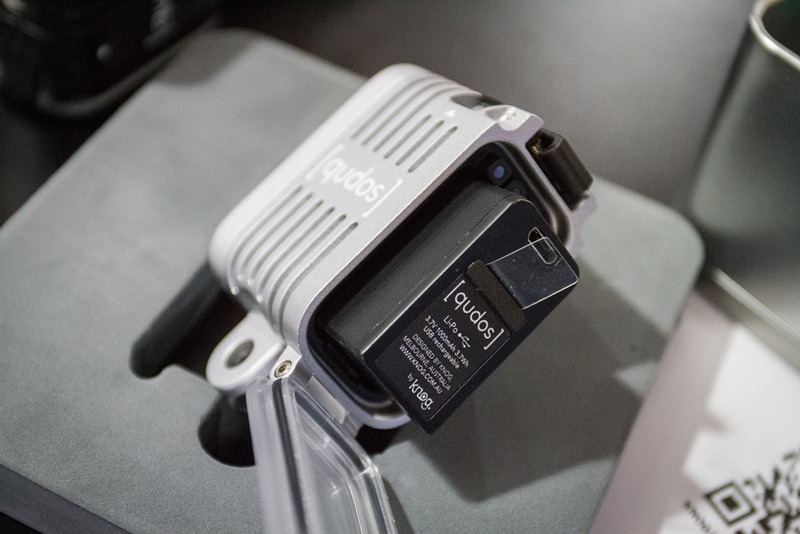 The Qudos just started shipping in Knog’s home country of Australia, and should find its way to other distributors globally by September 1st (at the latest). 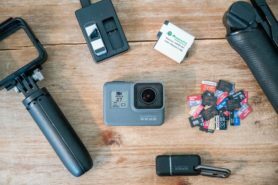 The price point is $119US for the full kit, and another $19 if you want the secondary adapter for non-GoPro action cams. Though, by mid-September they’ll also offer the non-GoPro only version for $119. Lastly, additional light batteries will be $39US. Obviously the core market here is likely mountain bikers (and scuba divers), rather than road cycling folks. 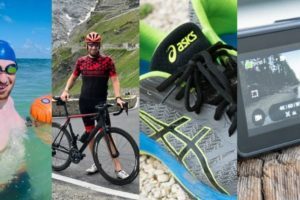 Simply for the fact that you don’t tend to see too many road-bike based night-time action cam videos, whereas you’ll find many more mountain biking ones. Still, I think it’s a cool solution. 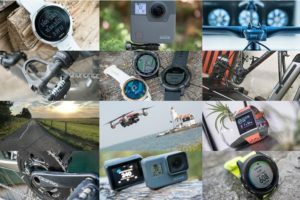 And, it’d be interesting to combine it with some of the out-front mounts that have a GoPro adapter on the bottom and a Garmin adapter up top – this making for one condensed little suite of electronic goodness – rather than three separate mounts sprawled along your handlebars. As usual, if you’ve got any questions feel free to drop them below. Thanks for reading! Wanna help support the site? Or just save some cash? Hopefully you found this post useful. I’ve partnered with Clever Training to offer all DC Rainmaker readers exclusive benefits on all products purchased. 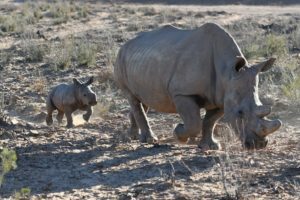 You can read more about the benefits of this partnership here. You can pickup the Qudos through Clever Training using the links below. 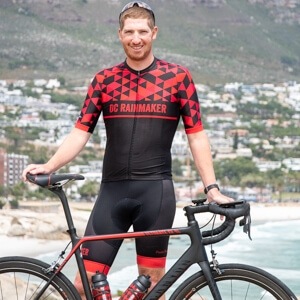 By doing so, you not only support the site (and all the work I do here) – but you also get to enjoy the significant partnership benefits that are just for DC Rainmaker readers. 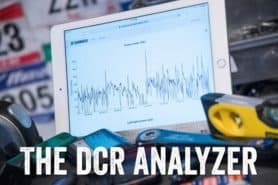 If you use the Clever Training links below you get 10% back on everything in your cart with coupon code DCR10BTF. Plus, since it’s over $75US, you’ll get free US shipping. Additionally, you can also use Amazon to purchase the Kudos or accessories (though, no discount). Or, anything else you pickup on Amazon helps support the site as well (socks, laundry detergent, cowbells). If you’re outside the US, I’ve got links to all of the major individual country Amazon stores on the sidebar towards the top. 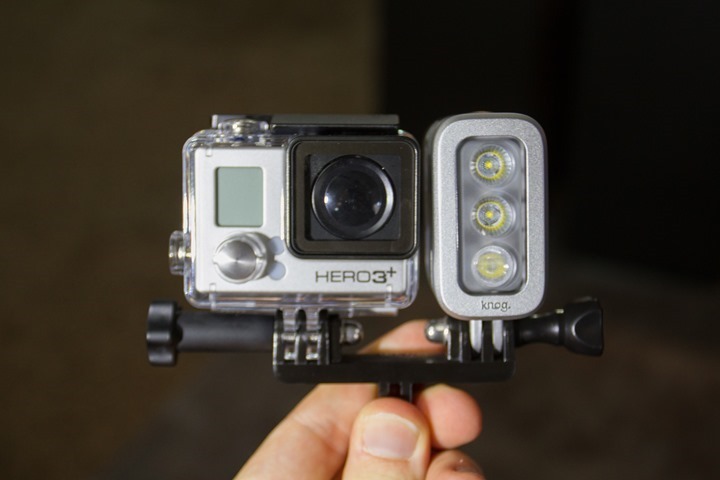 I’d like to see a mount for a GoPro above, with the light below. It would take up less handlebar space than having them side by side. 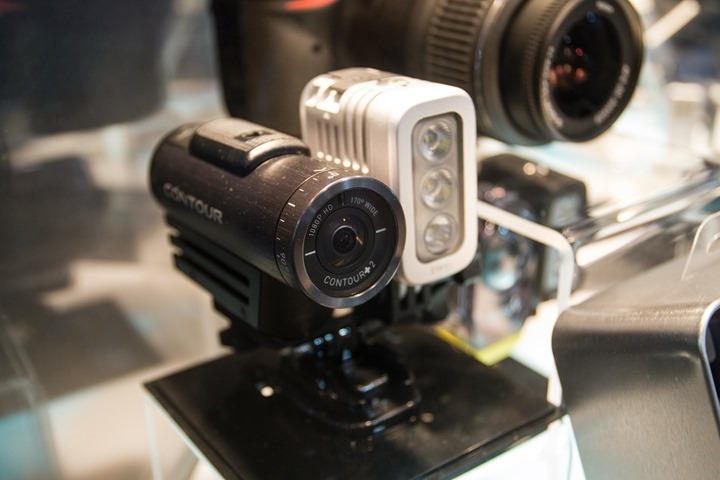 Something like the K-edge out front mount, but with mounts on the top and bottom. Do you currently know the pricepoint for extra batteries? I could see this as an alternative to lighting systems for endurance road biking events that go throughout the night as well as the day if a lighter overall bike weight is desired. 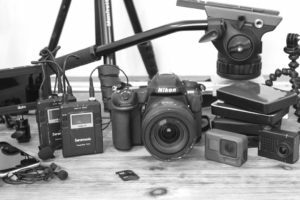 Looking forward to your detailed review concerning VIRB compatibility and tested battery life times. No, they didn’t have that info on hand unfortunately. I’ll see if I can get it from them now that they’re back in the office. Ok, heard back – $39US for a replacement battery for the light. I recently discovered this product but struggle finding it in the United States. I wann ause is partly as a bike light and partly with my GoPro. Anyone any clue? 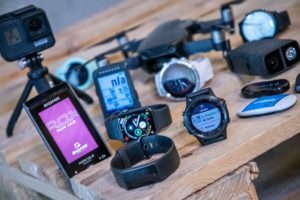 Are there similarly mountable alternatives? 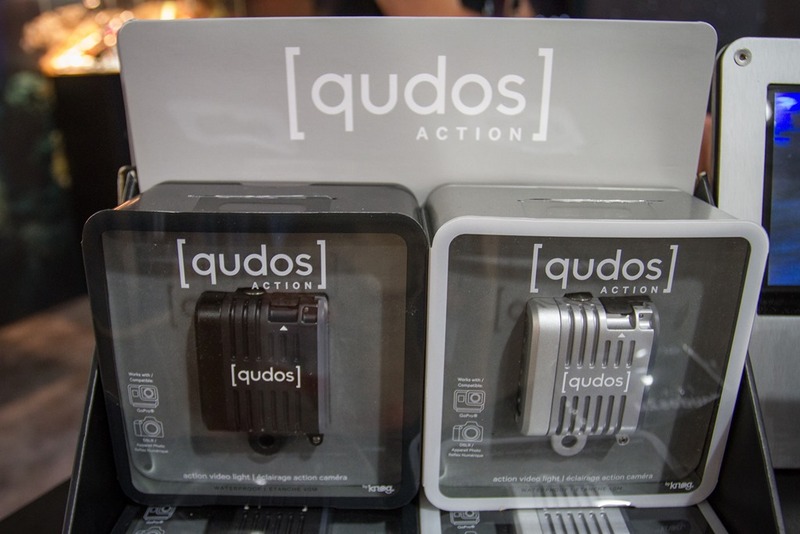 Hey Michael, we’re stoked to hear you’re interested in purchasing the [qudos] action light. You can pick this up in the US from stores such as B&H Photo and Amazon to name a few, plus the Knog webstore > usd.knog.com.au. Any questions then drop us a line at peeps@knog.com.au and we’ll help you out. 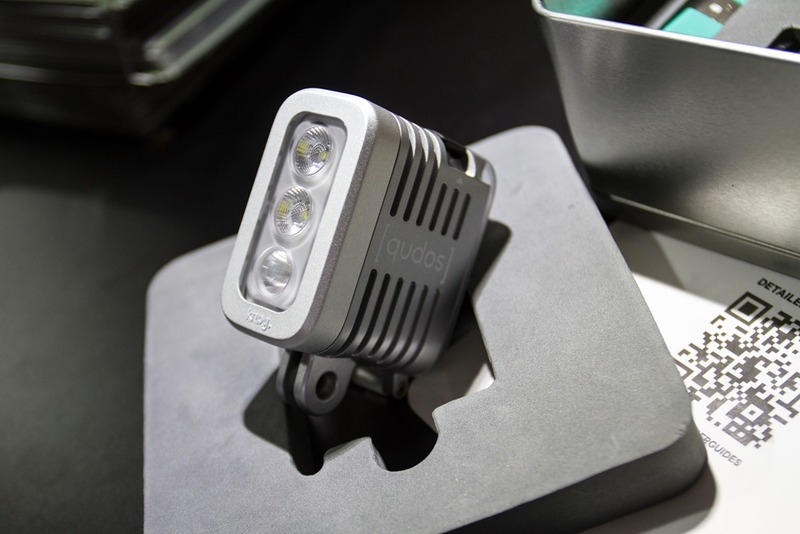 What do you think about using the Qudos or the L&M Sidekick Duo as an occasional primary bike light (tunnels or early morning commutes)?